The claim by Alibaba's CEO that they will create 100,000 jobs in the U.S. could be easily misinterpreted. 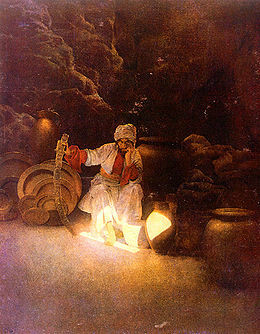 Ali Baba by Maxfield Parrish (1909). This one fits in the category of “Be careful what you say and how you say it” or “If it sounds too good to be true, it probably is.” Alibaba is an online B2B marketplace connecting small manufacturers (mostly in China) with buyers (mostly abroad). At Alibaba Group’s recent annual conference in Hangzhou, China, David Wei, the CEO of Alibaba.com, said his company will create 100,000 jobs in the United States over the next three years. Wow, that’s fantastic. In fact, it sounds a bit incredulous. Ariba, the largest of the best of breed sourcing and procurement vendors, currently has about 1,700 employees. So, does that mean Alibaba expects to have 60 times as many employees as Ariba in the US within 3 years? It turns out that what David Wei really meant was they believe that the Alibaba.com trading platform will create new commercial opportunities for its U.S. customers, resulting in those customers hiring an additional 100,000 people. Alibaba has no plans to hire 100,000 people itself. California Governor Arnold Schwarzenegger, who was attending that conference as a guest speaker, appeared to assume that Alibaba.com was hiring 100K people when he announced he wants to talk with Wei about how to get those jobs for California, and mentioned possible tax breaks for Alibaba.com. To be fair to both men, Alibaba.com actually has done some hiring in California, expanding from 25 to 200 employees in that state. While not 100K jobs, it is still a meaningful contribution to the state's employment. Furthermore, Alibaba.com will invest $3M in “the Emerging Entrepreneur Initiative,” a program to train about 3,000 college graduates in California in 2011 in conjunction with 15 state-owned colleges and universities throughout California. And if Wei is good to his word and actually does create those 100K jobs, even if indirectly, any misunderstanding here will be long forgotten.